Handcrafted pool table constructed to exceed BCA Tournament specifications. Solid-wood rails with diamond inlay sites, tournament approved K-66 natural gum-rubber cushions for perfect ball deflection, stain-resistant nylon/wool bed, and top-grain leather lines internal drop pockets. Comes with four 57" two-piece cues, bridge stick, brass bridge head, 15-ball triangle, 9-ball triangle, 10.5" table brush, 7" under rail brush, sure-shot chalk, repair kit, sure-shot billiard balls, 8-cue wall rack, and table cover. Accent glazing hand applied by artisans. Shipping, assembly, and installation included; arranged by vendor. Warranty does not include re-leveling of the billiard table. 98.75"W x 54.5"D x 31.75"T; playing surface 88"L x 44"W. Boxed weight, approximately 1,100 lbs. Table tennis conversion set includes flat table top for converting pool table to table tennis table and an accessory kit. 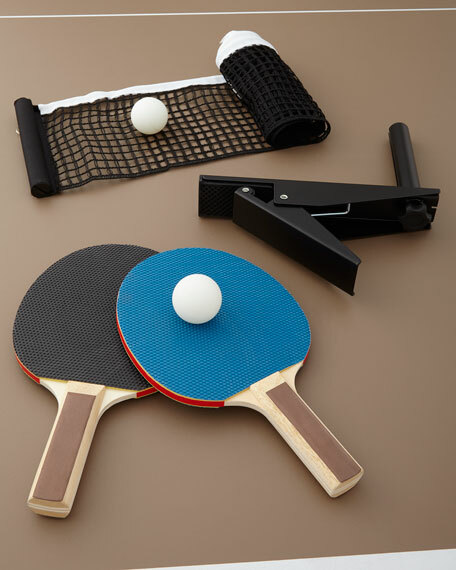 Accessory kit includes four paddles, for balls, a net, a clamp system, and weight supporters to prevent sag on the table top. Made of powder-coated steel and wood composite. 108"L x 60"W. Boxed weight, approximately 112 lbs. Please note: this item is special order; restocking fee applies if item is returned.